It may surprise you but Katoomba in the Blue Mountains west of Sydney, with its iconic Three Sisters rock formation, is apparently the number one tourist destination in Australia. No surprise then that big coach operator AAT Kings and its predecessor companies have been running day tours to Katoomba for 100 years. And the company could hardly have a better Katoomba tour coach driver than Adam Hammond. First and foremost of course are his safe driving skills, but Hammond also has good local knowledge and a lively and humorous commentary; a genuinely friendly manner; impressive organisation in juggling lunches and cable car tickets; firmness when needed; and the patience of a saint. 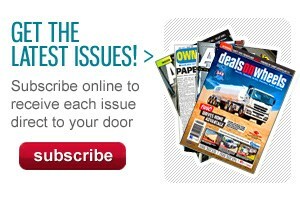 Hammond needed plenty of the latter on the day ABC magazine joined him on a recent day tour to the mountains. It was so foggy you could barely see 6 feet in front of you, let alone the famous sisters or the magnificent wilderness beyond. All but one of the full coach of mostly foreign tourists took the disappointment in their stride, one elderly American man putting a positive spin on things by saying he’d taken his best fog photos ever. However a young female European backpacker would not let up on venting her displeasure. Adam kept his cool impressively, and has a big future in international diplomacy if he feels like a career change. Adam Hammond has been a coach driver for 15 years, so he knows a good bus when he drives one. Bonluck (or BLK) will be very pleased to hear that Adam enjoys driving the new Star Gazer, based on the Chinese manufacturer’s President 3 dual axle model — the big difference being a tinted glass sightseeing roof. Hammond has been driving it regularly since new about seven months ago, and hasn’t experienced any mechanical problems in that time. He says the power provided by the 11-litre Cummins engine, which pushes out 440hp (323kW) and 2,100Nm of torque, is plentiful. He says the bus handles and brakes very well, which ABC magazine could also feel on the wet roads from the guide’s dickie seat next to the front door. You might think that with a glass roof, cabin heat could be a problem in the Star Gazer, but Hammond says the air-conditioning system is more than up to the task (Eberspächer with Carrier compressor). The unavoidable downside of not being able to have the air-conditioning unit on the roof, however, is that it takes up room in the luggage bin. The 80-litre AdBlue tank and batteries are in a separate compartment a little further back. All up, Hammond reckons the Bonluck ‘holds its own’ against a Mercedes-Benz or a Scania. "I reckon it’s a great bus in the city as well as on the open road," he says. AAT Kings operates all types of holiday tours all around Australia and New Zealand. It has a fleet of 70 buses, including about 30 top of the range Scanias with mostly Coach Concepts bodies, the newest ones with an all-up price tag of well over $600,000. 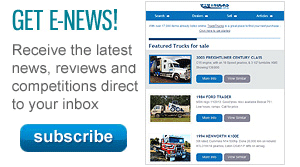 Scania Assist breakdown service is part of the package, and something Bonluck can’t provide. 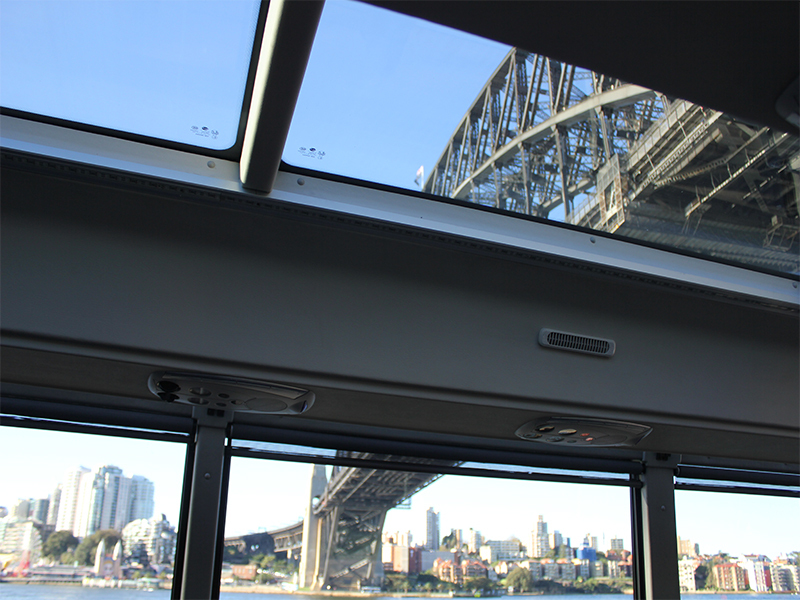 For Sydney-based day tours the company wanted something unique to enhance the sightseeing experience for tourists, hence the glass roof. Bonluck was the only manufacturer the company approached that could custom-make a glass roof and fit the air-conditioning unit in the luggage bins. 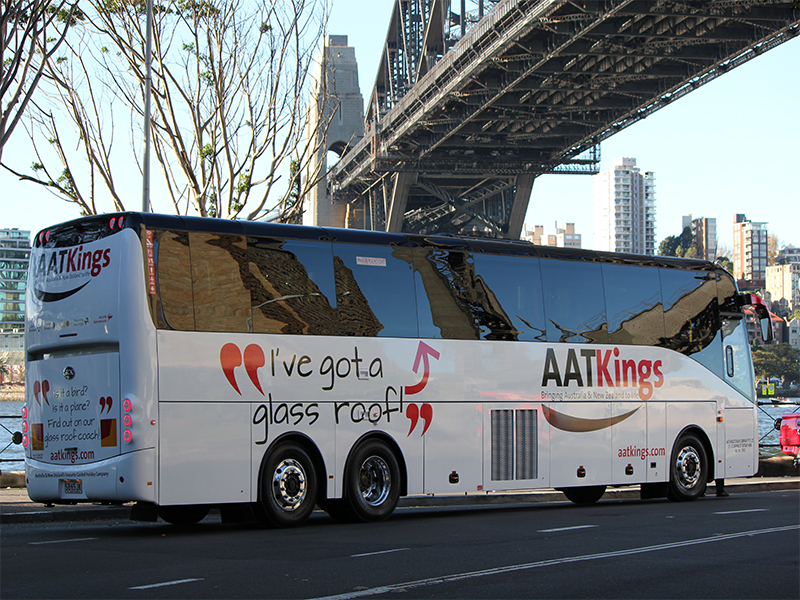 AAT Kings says it’s very happy with the result: "our guests love the glass roof," New South Wales coach operations manager Leo Kriketos says. Kriketos says the Bonlucks are also using slightly less fuel than the Scanias on identical day trips. AAT Kings has a policy of turning over its coaches every five years or so. Of course it’s far too early to tell how the Bonlucks might be faring in a decade or two, but Kriketos says so far so good when it comes to reliability. ABC magazine comments we hope quality control in the buses is a lot better than quality control on Bonluck’s websites. The English language version of the parent website is woeful; and the grammar and spelling is pretty ordinary too on the website of Brisbane-based Australian supplier, Bus and Coach Sales Australasia (BCSA). "With dedicated Australian engineers and staff which come from extensive Industry backgrounds, this ensures that are stringent ADR regulations and quality control requirements are adhere too," says the BCSA website, word for word. Leo says the general fit of the Star Gazers is indeed of a ‘high standard’ overall, with the inevitable small issues found in any vehicle, which he says BCSA ‘comes to the party’ on. AAT Kings does routine servicing and warranty work itself, with anything bigger required on the engine going to Cummins in western Sydney. BCSA can send body parts overnight from Brisbane. ABC magazine spent a short part of our trip with Adam Hammond as a passenger up the back, between cable car points at Katoomba. There weren’t any sights to see because of the fog, but even so the glass roof gives the coach a nice open feel. The leather Styleride seats are beautifully comfortable, and WiFi is a handy inclusion. Noise level is less than I expected with a Cummins engine. It’s unobtrusive but not quite as low as in the Scania/Coach Concepts combination. ABC magazine also spent a few hours behind the wheel of the BLK Star Gazer the following week, and it was a very pleasant experience on a beautiful sunny day. Just as Hammond comments, you wouldn’t think you were doing 100 km/h on the freeway, and the power up a couple of steep rises was appreciated. The 6-speed fully automatic Allison transmission is smooth and seems to change at all the right times. Comfort and vision are as good as you would expect in a top-of-the-line coach like this. It’s also reassuring to know that the coach has electronic brake stability (EBS) which includes stability control to help prevent rollover. 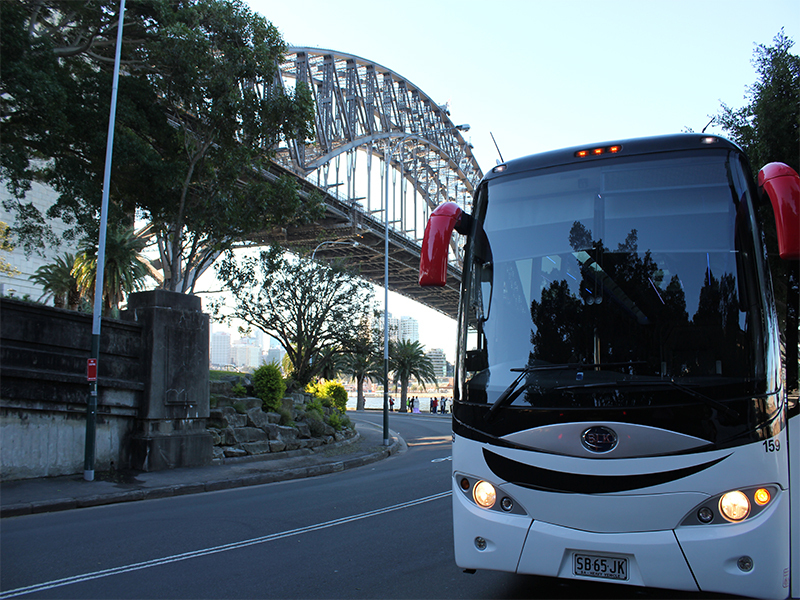 After a workout on the open road we then decided to walk in the shoes of a day tour driver who has to pick up and deliver passengers in the CBD, and braved the Sydney traffic at peak hour on the way to the touristy south pylon of the Sydney Harbour Bridge. Videographer Barry Ashenhurst and I quickly developed an appreciation for the skills of a CBD bus driver battling car congestion and tight corners in a rigid 13.5-metre vehicle. The excellent front steering was enhanced by the ZF steerable tag axle, which made manoeuvring in tight spots a whole lot easier. We only have a few minor criticisms of the Star Gazer, and they have nothing to do with the glass roof. One is that the transmission retarder is not strong enough. This wasn’t much of an issue around Sydney, but down a couple of steep hills in the Blue Mountains the foot brakes still had to be relied on. Presumably this is a relatively straightforward transmission control unit programming issue. Another quibble is that the Bonluck doesn’t come out of the factory with drink holders for the driver — AAT Kings had to retrofit those. The controls are pleasantly simple but the speedo is hard to read in daylight, even with the lights on; and you have to reach for the cruise control on the dash rather than it being on the steering wheel. Last and least, although the toilet sits low near the middle door and therefore doesn’t block any views, it doesn’t have the top quality of some other modern luxury loos. The door was a little bit difficult to open, which could be embarrassing for anyone who is busting. And on the day of our solo drive, the manual tap was playing up (these days some coach toilets have sensor-operated taps). However none of these minor complaints detract from what is an impressive coach.